[Rant] Zombies, get some brains! Hello folk of the internet. This is my first post for GD and I am starting as I mean to continue: with a mini rant. Some friends and I were playing through the No Mercy campaign on versus mode when my enjoyment of this game and faith in humanity was cruelly ripped from me. After some brave fighting and particularly silky teamwork, we, the survivors rode an elevator skyward after holding off the horde. As the lift doors opened we gallantly rushed forward to face whatever horrors awaited us, only to find it was much worse than we expected. We could not get out. As it turns out Valve overlooked something in the play-testing. The Special Infected are able to push some piece of construction equipment across the elevator door, blocking the exit. Roll on the most boring stalemate in gaming history. 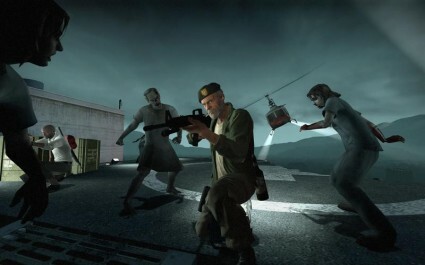 Zombies repeat the same tired attacks again and again and survivors crouch and shoot until they want to end their own lives. Press Y to insert your pistol in your mouth. Zombies, I urge you: Just leave it alone. Play the game fair. Survivors: If this happens to you, punish them by sticking it out. We played for 45 minutes, and we were treated to the delightfully comic sight of a hunter, tail between his legs, shuffling out to push the generator aside so we could continue.